Mark Cavendish lost out by inches to Marcel Kittel in a sprint finish on the final stage of the Tour of Britain, as Dylan van Baarle won the overall race. Van Baarle took the leader's yellow jersey on Saturday's seventh stage and retained his lead after Sunday's time trial, won by Sir Bradley Wiggins. The Dutch Garmin-Sharp rider then finished safely in the peloton on the final stage to win by 10 seconds. Michal Kwiatkowski was second overall and defending champion Wiggins third. The 2012 Tour de France winner was a further 12 seconds back, having moved up from seventh after the time trial, which was the first of Sunday's two stages in central London. An early five-man breakaway formed on the final stage - over 10 laps of the 8.8km circuit used earlier for the time trial - but they were caught with 5.5km left as the sprinters' teams fought for position ahead of a hectic dash for the line. It pitted Kittel against Cavendish on Whitehall and just as it looked like the Manxman had edged ahead, the German came back to pip him on the line for yet another win on British and Irish soil in 2014. It means he has won Giro d'Italia stages in Belfast and Dublin, Tour de France stages in Harrogate and London and Tour of Britain stages in Liverpool and London. 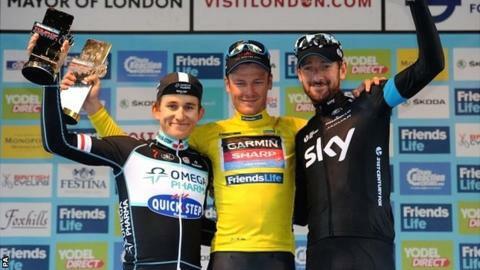 "It's nice to finish the Tour in the centre of London," said Cavendish. "Bradley won this morning and I'd like to have won this afternoon." Van Baarle was rewarded for his decisive move in Saturday's stage to record the biggest win of his career. "I was expecting top 10. It means a lot," he said. "I will remember this day my whole life." Wiggins was happy with his efforts over the week, ahead of the Road World Championships in Ponferrada, Spain, which begin on 21 September. "They [race organisers] were touting it as the toughest edition [and] most people say it's the hardest race they've done all year," he said. "To win the time-trial stage, I was more pleased with that, and confirms that I'm in the shape that I thought I was in, going into the Worlds next week." 10. Dylan Teuns (Bel/BMC Racing Team) + 1min 10secs.